Light up your home this holiday season with an array of dazzling LED Christmas lights! Designed to safely use both indoors and outside, these lights offer brilliance you won’t find with traditional bulbs. With a total of 100 C7 bulbs and five inches between each of the bulbs, you’ll have the ability to create breathtaking lighting displays almost anywhere! LED bulbs are designed to replace conventional incandescent bulbs with their outstanding brightness and luminosity. LED bulbs us approximately 90 percent less energy than their traditional competitors as well! This Christmas season is the perfect time to light up your home with the dazzling brilliance of LED lighting! 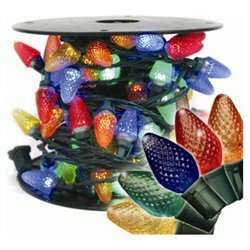 Bring a brighter Christmas to your family gatherings, add a multitude of luminous colors to your Christmas tree, or decorate the exterior of your home with this 100 Commercial Length Multi-Color LED C7 Faceted Christmas Lights set.